Slept pretty well at the Imperial - almost too well. Had to get up early, and barely made it in time for breakfast. Thankfully, the Imperial serves "English Breakfast" - which is protein, protein, protein, raaaarrrr bacon and eggs and beans! Hell yes! None of this stale pastry and fruit nonsense. After gulping down a tiny cup of tea, I left for the bus. True to my sister's word, many of my tour mates slumped against their seats in a fug of evaporating alcohol fumes, just as many from jet lag, and several Australians from both. Poor Sophie tried to get us to try a "speed-dating" exercise where everyone on an aisle seat switched seats every two minutes to sit with someone else, but no one was having that. We settled for introducing ourselves with alliteration - I impressed the group by announcing myself as "Enigmatic Elizabeth." Go go English degree! Before leaving for our day trip to Somerset, Sophie had our Dutch driver, Jan, drive us around the sights of central London as she explained their significance and dropped interesting facts. Like how everyone confuses the Tower Bridge for London Bridge. And how Londoners actually have to pay to drive their cars into the City part in order to ease congestion. 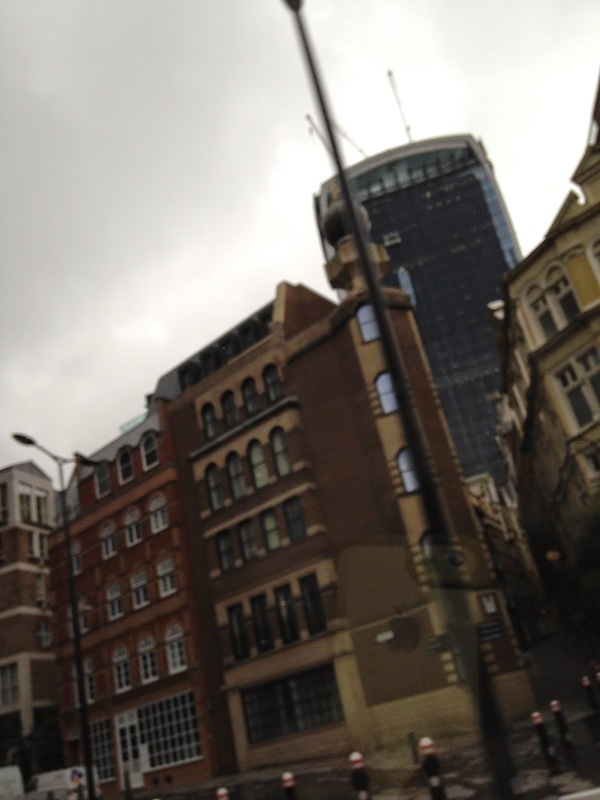 Pictured above is the infamous laughingstock of the London skyline - the skyscraper dubbed the "Walkie-Talkie" with the curved glass front that actually set fire to cars and rugs on the street opposite and now has to be covered with a tarp/screen thing. 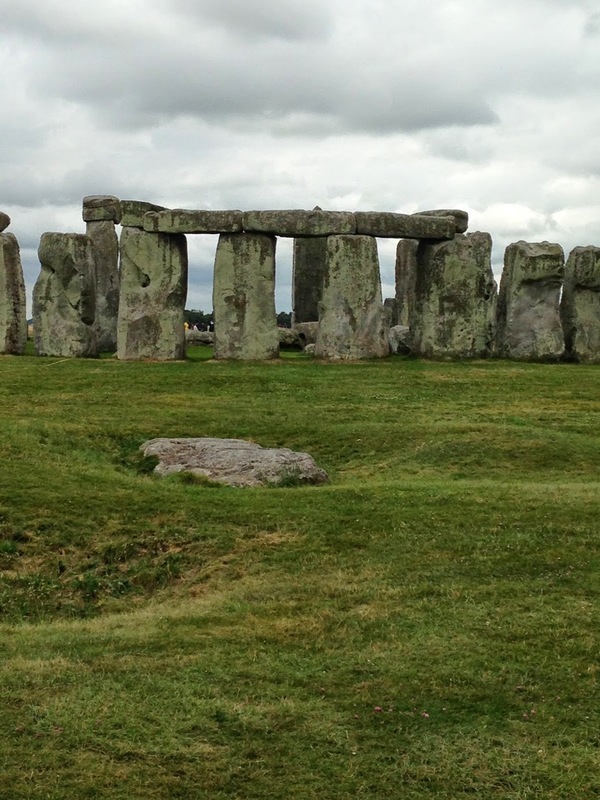 After the tour, we set out for Stonehenge. I wound up paying to see it, because there was only one tour bus so it was either pay to see Stonehenge or wait on the bus for two and a half hours until we left for Bath. The air was pleasantly cool, overcast without being rainy, and the stones were lovely, but not the most interesting things in the world. They're mainly fascinating because we still have no real idea who built them and why. I spent most of my time there making Spinal Tap jokes and judging which of my tour mates were cool enough to get the reference. Apparently a practising Druid was there that day, but I missed her while I was staring at irrelevant doodads in the giftshop (do I want a sparkly pink pen that says Stonehenge on it? Nope). After a quick bite to eat at the Stonehenge cafe, it was back on the bus to Bath! This was what I had been waiting for. I shivered with impatience as the bus lumbered through the increasingly beautiful and sunny English countryside. We would only get three hours in Bath, and I had to make those hours count. Sophie handed out extremely helpful maps before we arrived. By the time we got there, the clouds had cleared up completely and the trees parted to display a glorious, golden city bathed in sunshine. Seriously. 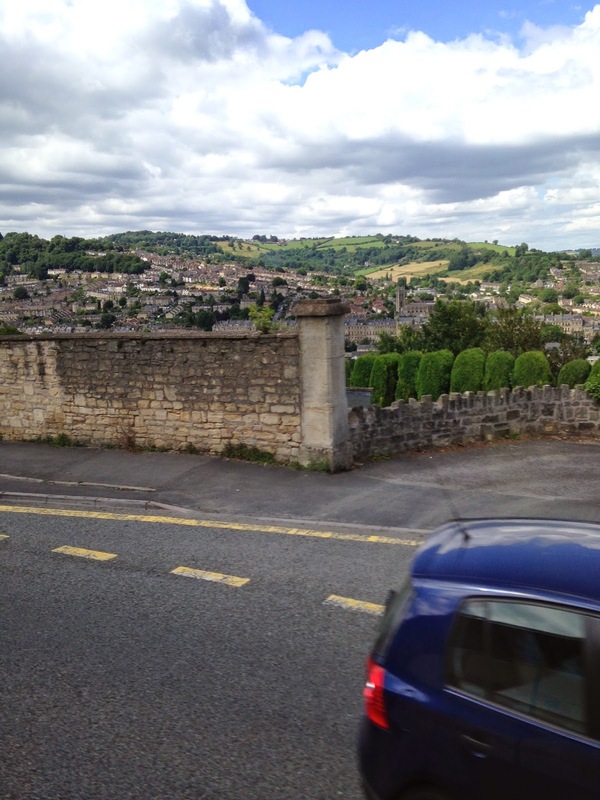 The entire city is a Unesco Heritage Site, and the main architects who designed the city hundreds of years ago used soft, yellow Bath stone - and so now you can't build so much as a gas station without using it, in order to preserve the view. Soooooo pretty. While Sophie went in to the Roman Baths to secure our booking, we were left to wait in the courtyard in front of Bath Abbey - a splendid church with fascinating carvings of Jacob's Ladder on the front (complete with carved angels climbing up to heaven). Sophie recommended we make use of the 45-minute audio tour of the baths, but I was having none of that. I had three hours to stuff with as much Georgian-Regency goodness as I could! 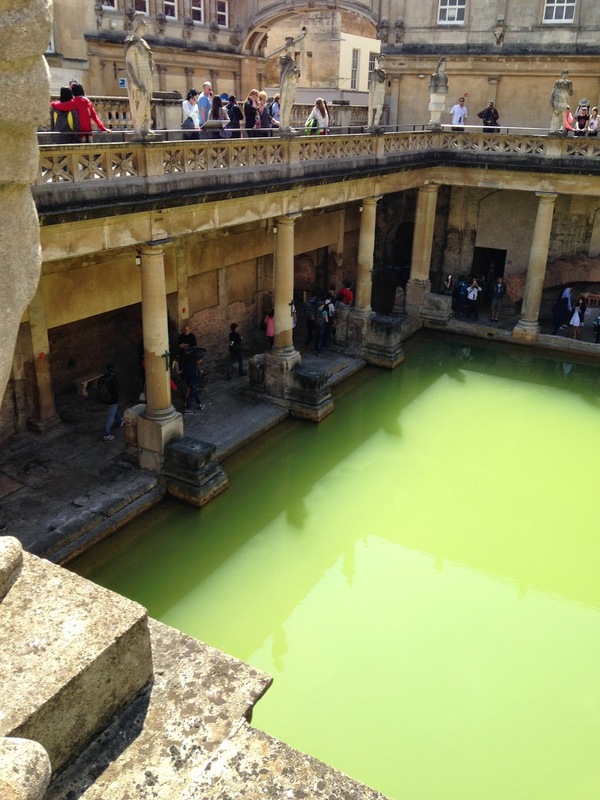 I whisked through the Baths, enjoying the statues and the 1000-year-old paving stones and the murky green water everyone was warned away from as it was untreated and likely contained Ye Olde British Diseases. The secret ingredient is kryptonite. I did taste the waters, from a special treated fountain, and found it tasted like a warm pocketful of spare change. Unsurprising. After that, I caught a glimpse of the Pump Room (now a restaurant, but also the setting for many a Jane Austen adaptation) and from then on - it was time to explore. I traipsed over as many of the golden cobblestones in my flat, unsupported sandals as I could. The air echoed with laughter and bird calls - a peddler was selling bird whistles by the marketplace. I bought the cheap plastic kind you fill with water, but he also sold the weird U-shaped whistles you put on your tongue. When you go "shhhhhhh" it makes a chirping sound! My foot started to ache but I had no time to slow down. Using Sophie's map, I made a bee-line for the Jane Austen Centre. Yes, the Jane Austen figurine is fake, but the footmen who open the door for you are real! It was all set in this narrow house that would have been very like the one Jane Austen and her family lived in. 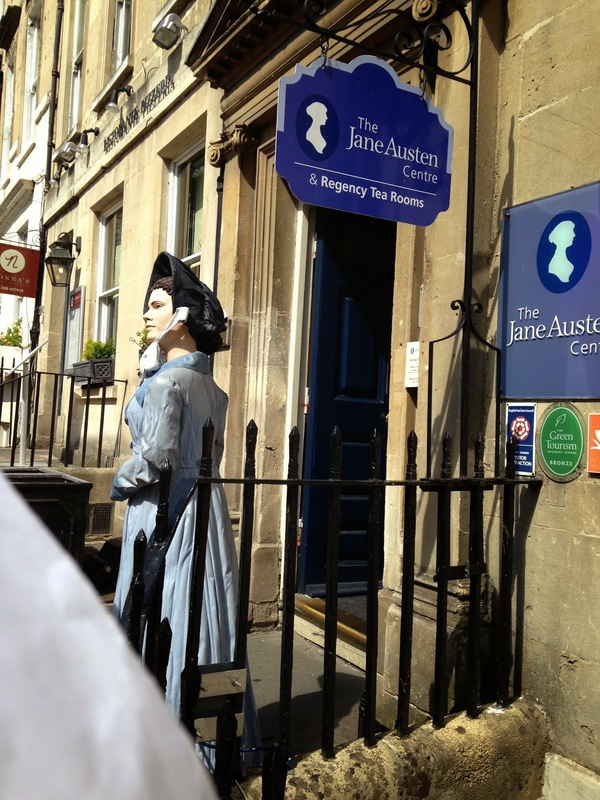 Of course, Jane Austen wasn't very happy in Bath, and did most of her writing in Chawton (where the major Austen museum is), but Bath is a setting in many of her novels (like my personal favourites Northanger Abbey and Persuasion) and also home to the Jane Austen Festival in September. They showed a video of it in the reception room as I waited for the presenter, and it looked like a lot of fun. I raced through the exhibits, trying to take everything in. I gazed at the dresses, tried on some bonnets, and even saw the new waxwork sculpture of Jane that had been sculpted using forensic science, portraits of her siblings, and first-hand descriptions of Jane from her relatives' letters. Half of the giftshop was given over to "I Heart Darcy" rubbish (I like the guy well enough but he's insanely overhyped and besides have you never heard of WENTWORTH? ), but I bought a lovely teacup and saucer, a leather bookmark, and a book on all the real estates used as settings for Jane Austen adaptations. 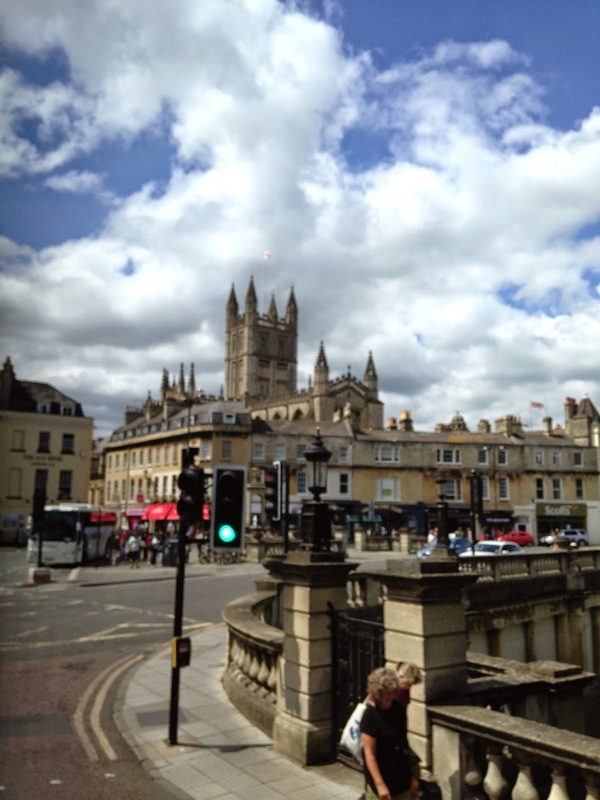 I felt a bit guilty in Bath, even as I was enjoying every minute of it, because I felt I couldn't afford to spend too much time on any one thing for fear of missing something else. After this, I ran (limping now, because my foot hurt) through the grand Georgian Circus. It's a bit startling to see cars parked in front and potted plants in the gardens. Yes, people actually live here - although from what I can gather the cost is astronomical. Next, on I went to the Royal Crescent. The beauty of this city is simply overpowering. The glorious Crescent looks out over a verdant lawn, with trees and hills and fields in the distance. Several tourists and locals were lounging about and picnicking on the green. On the way back, I stopped at the Georgian House on Number 1 Royal Crescent, but I didn't have time for the tour - just for the gift shop, where I snagged several postcards containing more stunning photographs of the city than I could ever hope to take. I had one more stop before meeting up with my group - there's a special bookstore that was recommended to me by a fellow blogger, Ana S. of Things Mean a Lot. A magical bookstore. 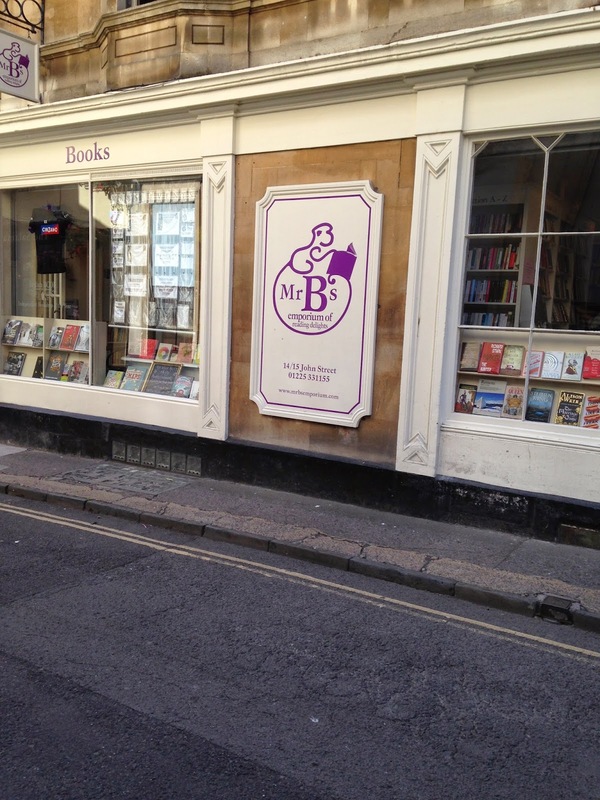 And I knew I couldn't visit Bath without seeing it - Mr. B's Emporium of Reading Delights, listed as one of the U.K.'s best independent bookstores. You guys. It was like a miniature Willie Wonka's - only with books and no child maiming! Set inside this beautiful little house, it was so charming and beautiful and well-organized - with personalized recommendations, a staircase wallpapered with Tintin cartoons, and a cozy little reading room on the second floor (right next to a shelf with Mr. B's World Cup reading list). Their website boasts a TON of author events, book groups, recommended reading lists, book subscriptions, and something called a Reading Spa (THERE IS CAKE INVOLVED). It made me want to live in Bath, which would probably be only slightly less expensive than regularly flying from Canada to Bath to see the store again! Of course, one doesn't just visit a famous bookstore and not buy anything - so I bought two books. Cuckoo Song by Frances Hardinge (because she's a British author) and a hardcover of Jane Austen's Persuasion (my own copy is a public domain eBook) which takes place in Bath and is my favourite of her novels. For an extra pound, they wrapped my books! LIKE THIS! IT'S SO PRETTY! The adorable red wax seal survived the trip home, I'm delighted to say. I still haven't opened the package. To be honest, I'm waiting until the tape dries out and I can safely unwrap it in one piece and KEEP it. What a delight! 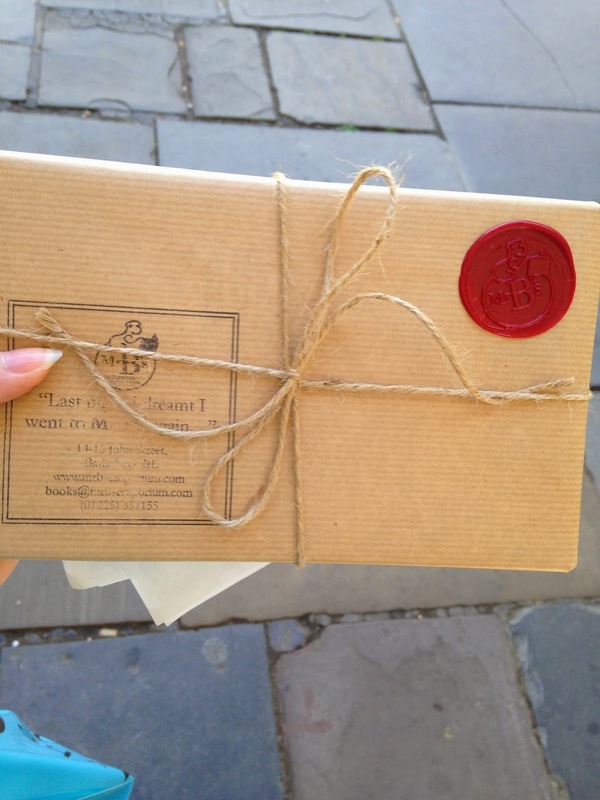 I clattered down the cobblestones of Bath under a blue sky with a beautiful brown-paper-wrapped-package under one arm and shopping bags in the other, listening to bird calls both real and fake. I met up with my friends in front of Bath Abbey once again. Anthony remarked on the address of the Jane Austen Centre (Gay Street and Queens Square) and said it was a perfect missed opportunity for a gay bar. Sadly, it was time to go, and I hauled my exhausted self back onto the bus for the long drive back to London. After storing my things, I decided it was time to be social, so I paired up with Trudy (another Canadian), Franco (from the Philippines), Anthony, and Mikey to look for a place to eat. Unfortunately, most of the bars were packed because - who knew? - it was the World Cup final! Thanks to a misunderstanding, I got separated from Trudy and the others and wandered disconsolately back to the bar closet to the hotel. There I met some of my American tourmates from Arizona. I ate some of their fries but really wasn't in the mood to order a whole meal, especially as there weren't many seats. I wound up standing at the bar, watching the World Cup final with three strangers who, while not unkind, knew each other much more than they did me and so unintentionally excluded me. But since I didn't want to walk back to the hotel by myself at night (with a foot I could barely put any weight on at this point), I forced myself to watch the entire, incredibly boring, World Cup final match. Football, it just isn't for me. After that, I was more than ready to sleep.